For me, St. Patrick’s Day is just a blip on the calendar that says wear green especially and only if you’re Irish. But if you are celebrating, prepare to be greeted by a sea of green Guinness-wielding revelers claiming their shamrocks. St Patrick’s Day is here and you probably don’t have a single green item in your wardrobe. The only thing green that I own is the copious amount of kale that resides in my refrigerator. I do though have an affinity for the hefty combination of green and blue, namely denim with any flavor green especially mint. 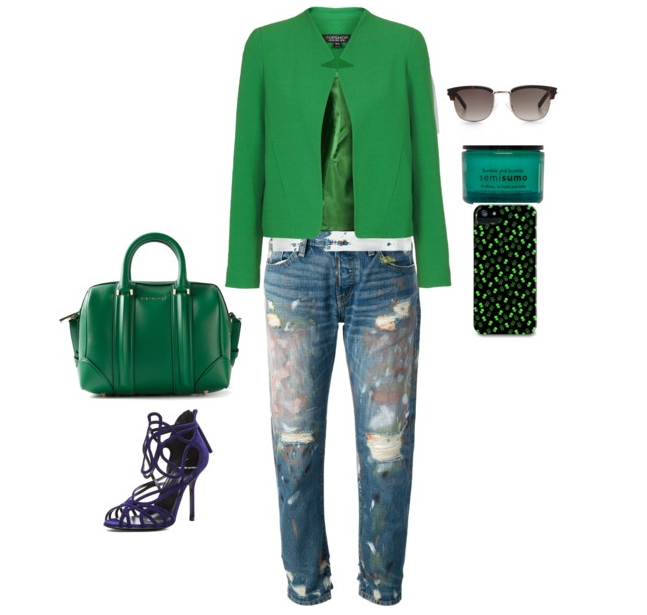 So get your wardrobe spring-ready with this look as it’s sure to go way beyond the celebrations of St. Patrick’s Day. Topshop jacket // Alexander Wang T-Shirt // NSF boyfriend jeans // Givenchy Pandora bag // Pierre Hardy shoes // Saint Laurent aviators // Bumble & Bumble semisumo // Fossil phone case or this one here.